On Saturday, BJP Leader Prem Shukla insulted India Today’s woman anchor Devina Gupta, when she asked him the meaning of Vande Mataram on a live TV debate. In a fit of anger, Shukla also removed his mic and furiously walked out of the studio. The journalist made her point by saying that nowadays politicians are only focussing on the national song and are not working properly in their respective constituency. 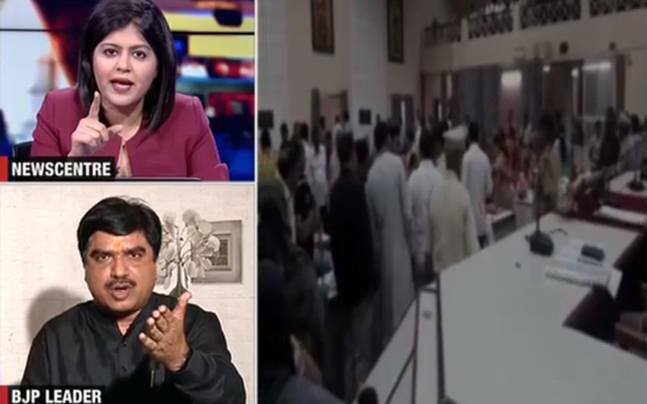 The debate was focussed on the recent incident happened in Maharashtra’s Aurangabad Municipal Corporation where the two All India Majlis-e- Ittehadul Muslimeen(AIMIM) corporators refused to stand up when Vande Mataram was played. Also, the members of the ruling alliance Shiv Sena-BJP got into a fight with the two AIMIM members. Meanwhile, Mayor Bapu Ghadamode suspended the two AIMIM members for the day.